Project obstacles and solutions: The H.G. Hill Realty Company broke ground in March 2015 on the $50 million Hill Center Sylvan Heights in Nashville, Tennessee. This mixed-use development includes 20,000 square feet in retail space, sites for 14 single-family homes, 260 apartments and 12 townhouses on the eight-acre site. Key to the entire project was the construction of a three-level parking garage. Charter Construction was hired to build the parking garage. The specifications called for a 4,000 psi concrete mix in the decks reinforced with welded wire fabric. IMI provided a mix that consistently met 5,000 psi. IMI QC/QA designed a mix that included corrosion inhibitor to protect the integrity of the steel. They also used a high range water reducer to meet strength requirements and a retarder to keep the mix workable. 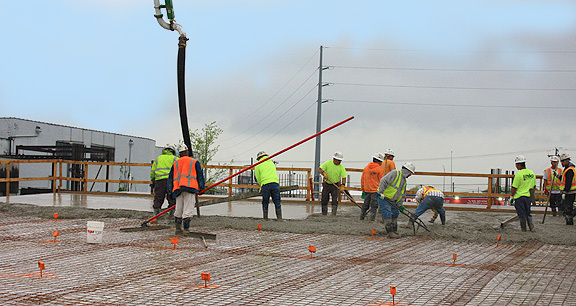 IMI delivered 2,500 yards of concrete at a six inch slump for the decks. It was pumped onto the site at a rate of up to 200 yards per hour. The Hill Center Sylvan Heights parking garage was completed on July 31, 2015. For more information on high strength, corrosion inhibiting concrete, contact a sales representative, click here.